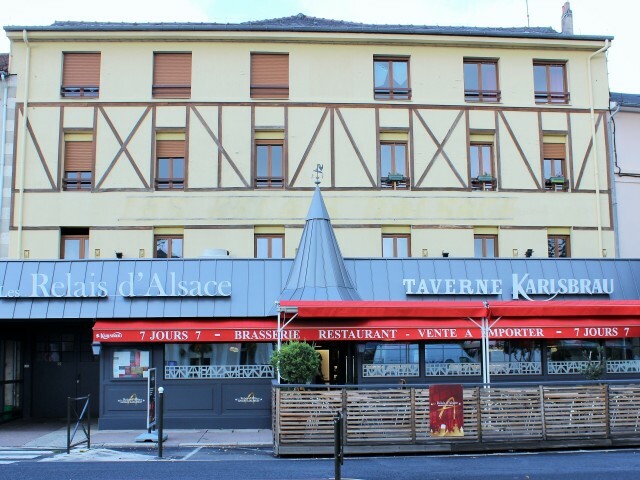 RELAYS ALSACE "Taverne KARLSBRAU" Brasserie restaurant open 7J / J. In a warm and authentic setting, we propose to discover a generous menu where house specialties distinguished: Trays seafood, traditional sauerkraut or Flammeküches sea gratin, fish and grilled meats à la plancha accompanied by wines making pride to Alsatian nectars and 2 seasonal offers Spring-Summer / Fall-Winter. In the kitchens of the Relais d'Alsace watchword is quality original France of products selected by the Chef according to strict criteria of freshness. Our customers are satisfied with the performance shows she appreciates our cards, plates are large do not forget that our motto is "OPEN TO LIVING LARGE TABLES GOOD" over our opening hours offers a wide amplitude. We offer other services such as loyalty card and gift vouchers to offer or afford, take away over 20 dishes prepared. A welcoming reception room 100 persons, equipped for private meetings and seminars. In summer a shaded outdoor terrace is installed. The "AFTER-SHOW" Prism, provides service later in the night. Finally, our commitment is: AS 4! Home smiling, friendly Atmosphere, tasty platter and wise Addition.